One of Italy's most charming regions is Le Marche, which sits on the Adriatic Sea south of Bologna. In its Monti Sibillini National Park, the Lake Fiastra reservoir is a popular tourist destination where visitors enjoy swimming and participating in fishing competitions. Since 1940, however, evidence of deep-seated gravitational slope deformation has been observed in the surrounding Apennine Mountains. These movements, which are caused by active faults and the area's tectonic setting, occur over larger areas compared to landslides. They are the source of the many trenches and deep-ground creeps (gradual, downward movements of soil) that endanger hikers. To monitor these ground deformations, Italy's National Institute of Geophysics and Volcanology is experimenting with an innovative solution. 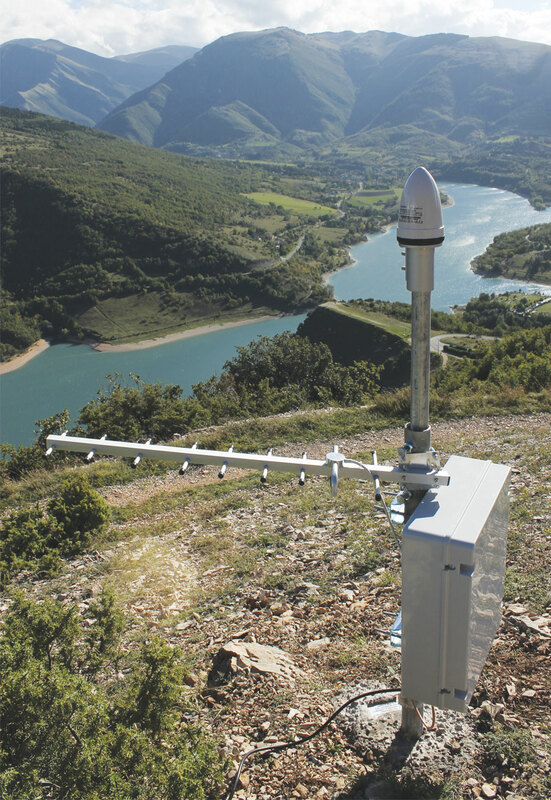 Developed by Esri Italia, it uses GIS and single-frequency, lightweight Global Navigation Satellite System (GNSS) sensors to detect possible anomalous movements in the mountains and identify potential areas of impact. Moreover, the development of new navigation satellite systems around the world, such as Europe's Galileo and China's BeiDou, will soon ensure that measurements can be repeated, even for low-end, compact sensors—a fundamental element for monitoring slow, nonlinear drifts that are potential precursors of structural terrain failure. 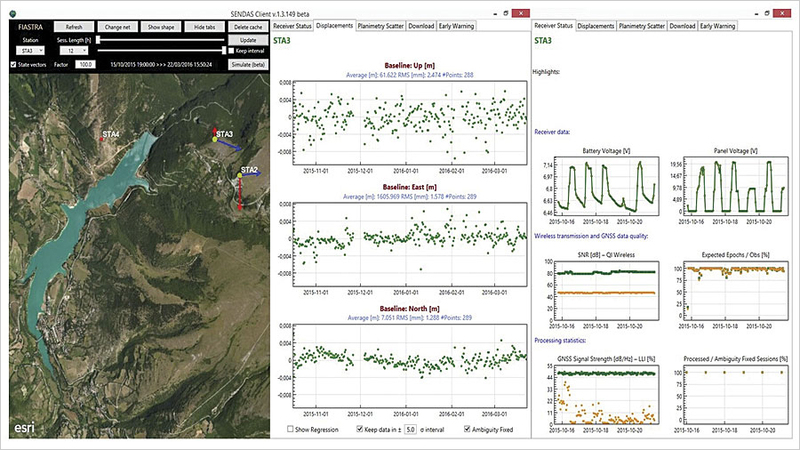 Data is transmitted, stored, and processed regularly on one of the National Institute of Geophysics and Volcanology's servers using NDA, a software entirely developed by Esri Italia. The software works best with single-frequency receivers that form local area networks with baseline lengths (the distance between a base station and a rover) of up to 10 kilometers. 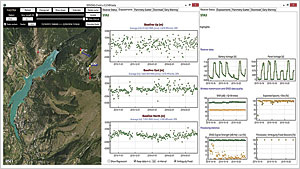 Using a dashboard, end users at the National Institute of Geophysics and Volcanology or with the National Institute of Oceanography and Experimental Geophysics can check the field sensors' telemetry, as well as other information, such as the efficiency of wireless data transmission and the GNSS data quality. If there are malfunctions in the system, or if the land's deformation rate exceeds a preset threshold, the dashboard sends warning emails to those at the institute who are responsible for preventing potentially catastrophic events. Around Lake Fiastra, "SENDAS is used by [the National Institute of Geophysics and Volcanology] to [monitor] movements induced by a deep-seated gravitational slope deformation causing sinkholes in the ground, often tens of meters deep," said Massimiliano Chersich, the Esri Italia GNSS solutions manager. Esri Italia has deployed four SENDAS sensors around the lake to constantly keep track of very small land shifts. This allows the institute to react before any sinkholes form—closing trails or roads to protect the national park's visitors.